Valhalla 2 receives Positive Feedback’s Writer’s Choice Award! 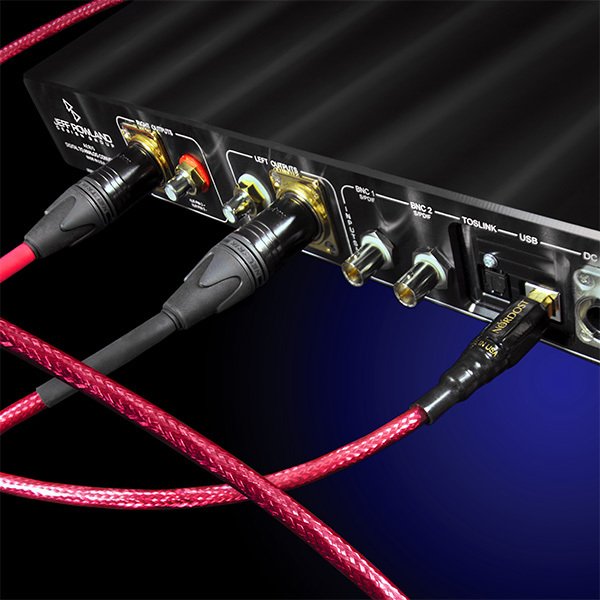 Throughout this past year Nordost has been highly recognized by industry leaders and journalists with a slew of fabulous reviews. But the recognition did stop at articles. In 2014 Nordost’s products, ranging from Leif to Norse 2 to Reference, have also received awards. The Blue Heaven USB 2.0 was awarded hi-finews Outstanding Product and our Heimdall 2 loom received the CANDA HiFi Editor’s Choice. Now we can add one more to our collection! This past week the 11th Annual Positive Feedback Writer’s Choice Awards for 2014 were released, and Nordost was once again acknowledged. 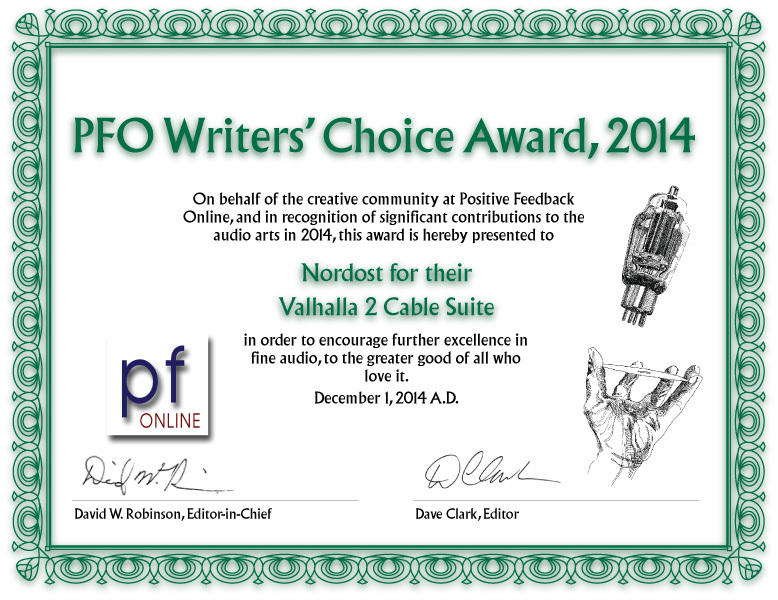 For Guido Corona the Valhalla 2 cables were an easy choice for the PF Writer’s Choice Award. In this article, Nelson reviews a recent performance at Scullers Jazz Club. The legendary multi-instrumentalist Arturo Sandoval brings an accessible and amiable presence to his concerts: he comes to play and enjoy himself in the camaraderie of his band mates and his adoring audiences. At his concert held before a packed house at Scullers Jazz Club in Cambridge, MA. on Sunday, November 30th, Sandoval and his band performed a joyous rumble through worlds created from funk, bebop, calypso and classical elements making music that was deeply soulful and vital. The show started off slowly with some house sound adjustments and Sandoval softly playing a solo on his trumpet, parsing notes with a delicate whisper. There was a brief moment when it seemed that the rest of the band was trying to figure out how to gain a foothold in Sandoval’s shifting sand of quiet notes. However, their searching quickly came to a wonderful destination as saxophonist Ed Cale unleashed a forceful and sensual solo on his sax while pianist Kemuel Roig provided quicksilver descending notes and colors. Percussionist brothers, Alexis and Armando Arce, added shimmering conga and drum accents as Sandoval retraced his steps with easygoing soulfulness, ending with a final, saluting blat in his trumpet’s lowest registers. With a dance of his shoulders, Sandoval then moved everyone into a blazingly fast bebop tune, all flash and fleet footed. Sandoval’s trumpet soared and careened from high to low, defying gravity and ripping up notes in its dapper chatter. His legendary trumpet playing was a joy to behold at this concert. Sandoval demonstrated his genius for carving out space, dynamics and myriad textures on his trumpet in order to let the emotions of the music flow freely. His notes never seemed to run together, no matter how furious the pace. There was always a sense of space between his trumpet notes and this resulted in everything, (from his furious trills to his deepest growls), being distinct and clearly defined. As a result of this marvelous gift, it was easy to follow each of Sandoval’s intrepid steps up and down his trumpet register and to hear all of the rich textures (and midrange golden hues) that he rewarded along the way. On his highest soars, (at one point, Sandoval comically looked upwards for heavenly inspiration to hit his apex note), each was heard mercurial and distinct. Even when he added his comic touches, (by hitting the sepulchral depths of his horn with breathy rasp), such deep tones were heard distinct and resonant – like all of his other stunning creations. It was also a surprise (and a delight) to hear Sandoval’s masterful piano playing at this concert at Scullers. On one selection (that traversed melodies and rhythms careening from Broadway to Cuba), Sandoval delivered a light, swinging facility to his piano style. His buoyant selection of notes and chords brought great drama and a joyful dance to the eruption of colors and groove he created. Everything in his playing was wide open and roiling with tension until a surging wave of repeated piano chords brought the solo to a glowing close. Again, Sandoval’s great parsing of space and elegant feel for dynamic touches made every step of this sensual global dance vivid and involving. After this delectable piano number, the band returned to its funky and brash side, playing several numbers that pushed dance to the fore and never let up. The young and cleverly adventurous Roig returned to his piano seat and took off on a solo that hit huge stride chords (reflecting his Cuban and Miami heritage) with funk galore; twisting and turning but never losing sight of the groove. Roig created a beautiful curtain of sound that Cale punctuated with his brawny sax calls and Sandoval tumbled and twisted with his precise trumpet (leaning backwards for that last high burst of wail). Phell’s electric bass kept the funk foundation churning while it was up to the Arce brothers to bring the show to a close with their consummate synthesis of drum and congas – with a sharp drum stick on a cow bell that rang out sharply and punctually to keep Maestro Sandoval and the rest of the band from lifting off the ground completely. For a great slice of Sandoval at home, grab a copy of his Dear Diz (Every Day I Think of You) [Concord Jazz – www.concordmusicgroup.com]. Here’s a big-boned recording of Sandoval with a large ensemble of stellar musicians who, like Sandoval, reach for the stars at every turn. The album is a heartfelt homage to the incomparable bopster and humanist, Dizzy Gillespie, Sandoval’s dear friend and mentor. There are blazing solos from the likes of Ed Calle (on a rollocking version of “A Night In Tunisia” that also features a brawny and deep trombone solo from Bob McChesney and a solo by Sandoval that echoes some of distinctive sounds heard in concert at Scullers); B3 Hammond organ pyrotechnics from Joey DeFrancesco (on such blazing numbers as “Things To Come”) and other fabulous moments throughout. The recording is superb, with a sprawling soundstage and great image dimensionality. The love for Gillespie and his music pours forth from this recording with great panache and joy. Nordost is gearing up throughout this holiday season for CES in Las Vegas. Both Nordost’s US and International sales teams and product trainers will be at the Venetian on floor 29, Suite 106, January 6-9. They will be running meetings for our loyal dealers and distributors, as well as performing live product demonstrations. Throughout the show Nordost will be showcasing our latest Reference cable range– Valhalla 2, as well as making cable comparisons and demonstrating our newest products, including the Heimdall 2 USB 2.0, QK1 AC Enhancer, Tyr 2 Power cord, Sort Füt and the Heimdall 2 Headphone Cable. We hope to see you all there for a very exciting CES 2015!